Probably SSH is not as clean and fast as other useful tools like netcat, but it has some features which are very useful, and when you'll need them, here's how to behave with that huge amount of computers all over your house. SSH stands for Secure Shell and is the smarter and safer version of telnet. Secure means that this network protocol makes use of cryptography, so that SSH servers and clients communicate trough a secure channel. SSH is mostly used in an Unix context, however running it on Windows can be very useful. Obviously, SSH is powerful when you have physical access to the computer when talking about offensive, but always very reliable when talking about defense, so let's say it's an important piece of knowledge in security awareness field. For example, you may want to use SSH to have an authentication process instead of netcat (that's not going to happen any time soon, right?) or, since SSH clients are very smart and useful, easily transfer files and browse them as you mounted the server on your desktop. I also noticed that Alex Long here on Null Byte gave a lot of interesting uses of SSH, so, go check those how-tos if you want more. Unix-like OSes usually make use of SSH by default. Where port is 22 by default, in most cases. Generally the password is the user or admin password. Let's give a closer look. As today, most linux distributions have SSH installed by default. In the example, we are using (well, that's kinda obvious) Kali Linux distribution. in the picture I connected to a Macbook which username was "user"
Eventually, the first time you connect Linux will ask you if you want to continue connecting. This is not random, be sure that you know what are you doing. As you can see, the result is the terminal line, where we can run any Mac Unix Terminal command directly on he server, just like we were sitting in front of it. Suppose you don't have SSH (the server part, Unix has terminal client by default). How to install it? 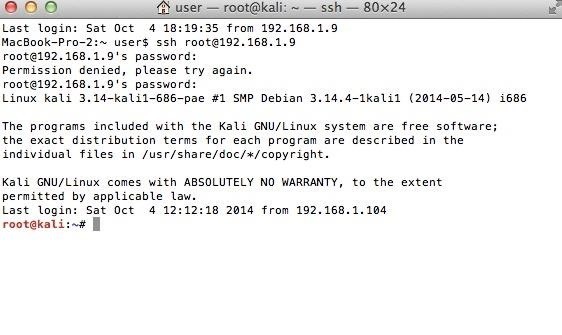 If you are running a Kali Linux Live OS the password for a Live Boot is "toor", else you have to use the sudo password. in the picture, the username on Linux distribution I had is "root"
Logging in and from Mac pictures are shown in the above section. As you may have understood, SSh is not built in windows by default, nor will be any time soon, but we have plenty of ways to install SSH servers and clients on Windows. 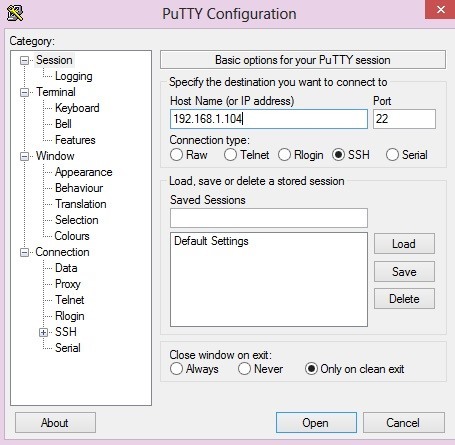 You will probably recognize "Putty", as shown in some previous how-tos. NOTE: I personally tried those two methods, and I'll tell below where I succeeded and where I failed. However, it does not mean that this is safe. I'm not saying that this is not, but I quite like disclaimers, you never know. Back on Track (ehm ehm, was this the joke? ), I recommend those two ways to setup a SSH server on Windows: FreeSSHd and OpenSSH port, but I'm only posting the first one as it is the only one that worked for me and the port seems very confusing and annoying to setup. If you have Cygwin you can run the ssh server with no problems. FreeSSHd has a GUI, but it aims to be quite hidden. Download it at:http://www.freesshd.com/?ctt=download (as always, be sure that nobody is eavesdropping on you and that the site is still being legit!). At first, you don't have that little icon at the bottom right of the taskbar. In the "Login" field write the username we'll use to connect to the server. 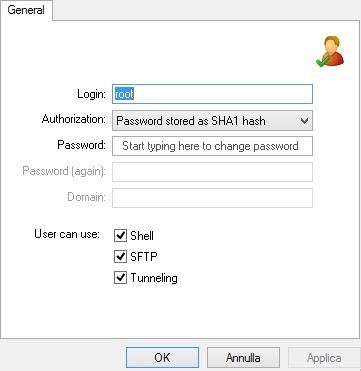 In the Authorization menu choose "Password stored as SHA1 hash". In the "Password" field write the password we'll use to connect later to the server. Make sure you check all the three checkbox, but again: always make sure nobody is eavesdropping or MITMing on you! Then login like shown multiple times above. To shutdown the server, simply right click on the little icon and "unmount". Here comes the client part. according to your windows version. I can say that this looks very nice and has tons of features, you'll enjoy it. We are going to use SSH (Connection Type check box), but as you can see, it has more types. Enter the ip address of the server in "Host Name" field, then click Open. logging in the same Mac as before, where username is "user"
This saved the life of my iPhone many times. If you have a jailbroken iDevice, you MUST have SSH access to it. Generally OpenSSH is installed by Cydia when running it for the first time, but not always. ssh root@ipaddress with default password "alpine". And you can login in SSH servers with the "Mobile terminal application", which provides the ssh command. If you are rooted, for this purpose you can use "SSH Server" and "JuiceSSH" respectively as server and client. If you still want to know more, there are some programs which actually let you browse the files on the SSH server, practically "mounting" them, making downloading and uploading very easy. Some examples are WinScp (Windows), CyberDuck (Mac), Nautilus (Linux) and, when speaking about iDevices, iFunbox (Mac but no SSH client, Windows, you can manage to let it work on Linux too). I can't spend too many words on this, these programs are many but they work the same as seen before with Putty more or less, it's just a matter of GUI and even easier operations. If you really need to know more about one of those programs, tell me in the comments and I'll edit the post, but now you should have enough knowledge about the topic to make things work properly. So, you can obviously do this in Wan too, you just have to open the port 22 (by default) or the one you chose on your router (if you need specific help, feel free to ask). EDIT: As CyberHitchHiker suggested, you should always change the port ,when possible, to something above 1000. Today, experts may have noticed, I only talked about authentication trough password, which I think is enough, although there's another way to authenticate, with public keys, so if you want to know more just ask in the comments. I strongly recommend you to always change default passwords (e.g. "alpine", which is a terrible error not to change) and always choose a very strong password if you are thinking to open you server to the wan. Follow OTW's recent demonstrations about how easy password cracking is, and also his advices on how to protect yourself from these attacks. I'm very sorry for any eventual mistake I made in terms of grammar or concepts, please tell me if you found any, thanks. Also, tell me if it'd be useful to have a cross platform GNU compiler how-to, I'll be pleasured to write it down. Thanks for the info. I would change ssh port from 22 to something else above 1000 if possible. Thank you for the great advice, you are totally right, it's very dangerous.